This will be a somewhat longer and more complex post than WC ordinarily produces. The subject is more complex, and worthy of a longer read. Richard Dawkins spoke at the University of Alaska Fairbanks on July 15, 2010. Davis Auditorium was packed, with a number of folks standing and still more watching in another lecture hall and on the Web. For anyone living under a rock, Richard Dawkins is one of the pre-eminent philosophers and ethologists in the world. A respected scholar of evolutionary biology, he is unflinching in his willingness to think through the implications and lessons of biology and, in particular, evolution. He is also, famously, an atheist, and not a bit shy about it. His lecture was a compressed summary of the evolutionary aspects of religious belief. The shockingly bad acoustics in Davis Concert Hall, combined with the intellectual pace Dawkins keeps in his lectures, made it a significant challenge to keep up. It’s almost as if Dawkins is intentionally challenging his audience to keep up. But, with the benefit of a Mac Book Pro and skillful, sometimes amusing slides, Dawkins made a series of points. He noted religion is ubiquitous, which implies it must have some purpose. Why does it exist? After reminding us that he views evolution as operating at the level of the gene – the reductionist approach to evolution that he champions – he asked how a religions can confer an evolutionary advantage on a gene. He rejected the standard reasons out of hand, because they do not operate at the level of the gene: willingness to take additional risk, because death is not the end of all things; preservation of social order; or as a utility of nature. None makes sense at the genetic level. None of these explanations makes sense as maximizing something for the benefit of the gene. All, in Dawkins’ view, are non-Darwinian explanations for religion. So, asks Dawkins, what good is religion in the Darwinian sense, when measured at the gene level? He asked this question while showing a slide of a man photographing a group of women dressed in head and body covering burkhas. It’s a nice way of making the point that religion, like the photo, doesn’t always make a lot of sense. One theory is that religion provides comfort and thereby reduces stress, with attendant evolutionary advantages. But as Dawkins noted, teaching young children that they will burn for all eternity in Hell if they are bad isn’t exactly stress reducing. And, as you look around society today, there is little evidence that any religion is reducing stress. Another idea is that evolution operates at the level of tribe. There are several difficulties the the hypothesis. First, where one tribe has a war-like God, and the other has a peaceful God, it’s hard to see any evolutionary advantage to religion. While it might be good for one religion in competition with others, it doesn’t help the gene. It doesn’t work as ecological competition. It’s not a model of Darwinian selection. If it’s not good for the gene, is it good for the meme, Dawkins asked. Good for the meme? Dawkins promised to return to the matter of memes, if time permitted. In the event, under time pressure and the desire to answer audience questions, he did not. He lanced lanced Scientology, calling L. Ron Hubbard “a shameless opportunist.” He called Joseph Smith “the enterprisingly mendacious inventor” of Mormonism and “an obvious charlatan.” But still the right target for the obvious question, why have these two recent religions been so successful, given their dubious origins. In the event, Dawkins concluded that religion is a symptom of a series of predispostions which manifest as religion: childhood creduilty, a child’s tendency to attach a purpose to everything and what he calls “vacuum behavior.” He explained each predisposition in some detail. Childhood credulity has a survival value; children are taught to obey their elders. Dawkins’ example was, “Don’t play in the river, there are crocodiles there.” Children who don’t obey the warning are less likely to survive. Credulity – the will to believe – has obvious Darwinian benefits. But not all elder direction has survival benefits. Dawkins also pointed out children as natural theists: they ascribe purpose to random events. It’s possible to discern a Darwinian advantage to seeing unknown agencies. Was that a leopard in the grass, or just the wind? The doctrine of asymmetric benefit operates: Pascal’s Wager. You can err by a false positive – thinking there is leopard when there isn’t; or you can err by deciding it’s the wind when it’s a leopard, a more serious consequence. But science arose when people began to shake off the suspicion of agency. Sometimes humanity can be viewed as a hypersensitive agency detector. Finally, there is what Dawkins calls “vacuum behavior.” He showed a video of his dog trying to bury a bone on the carpet. It’s activity inappropriate to the situation. The behavior might be appropriate in one setting, but it is carried over and acted out in a situation in which it is inappropriate, because of the absence of a recognized appropriate conduct. For Dawkins, “vacuum behavior” explains why adults retain the child behavior of theism and credulity. That “vacuum behavior” is what leads an athlete who score a touchdown to thank God. We are, as Dawkins notes, a social species. Part of being a social species is the debt-gratitude-grudge cycle. Dawkins says we have an innate mechanism to track mutual obligations. Before we had money, we had a kind of mental currency in mutual obligations. The obligation network can become quite complex. Dawkins seems to imply that the mutual obligation network has a Darwinism value at the gene level. That obligation network is an important factor in how religion is practiced. That obligation network, too, fires off in inappropriate situations. Gratitude, guilt and resentment fire off in a vacuum, and trigger these behaviors. So Dawkins concluded, then, that the urge to confess, athletes thanking God, and the sense of unfairness all trace to the same root behaviors: credulity, animism and inappropriate behavior being acted out in situations where there aren’t known behavior maps. Religion, in Dawkins’ view, is appropriate childish behavior being carried over into inappropriate situations. The childish behavior has Darwinian benefits for children, but gets carried forward into wildly wrong areas in adults. Unfortunately, Dawkins ran out of time to carry the discussion into memes. Memes are an idea largely originated by Dawkins. If you’ve read The God Delusion you know that memes play a major role in his analysis of religion, but he didn’t have time for it in his July 15 presentation. He did reserve time for question and answer. Without going into detail, WC was pleasantly surprised at the civility, intelligence and courtesy of the questions and the answers. Perhaps the most interesting dialog came on the issue of consciousness. Dawkins was asked if he could define consciousness. He quoted Bertrand Russell, and then drew a distinction between consciousness and ethical consciousness. He sees consciousness in many animals; he sees ethical consciousness only in humans. WC enjoyed the lecture very much. Alaska’s various loose nuts were on generally good behavior – although handing out bibles at the entrance was a little over the top. Thanks to Professor Richard Dawkins for coming to Alaska. An excellent lecture. ← Social Security: What Crisis? I heard a half hour or so interview he did on NPR last winter and was totally blown away by the man. But he did (in that earlier interview) raise a few questions that appear to be potential ‘plot holes’ with regard to strict evolution. The most prominent and easy being, why haven’t we ‘evolved’ beyond self destructive behavior? And my person favorite, what about Instinct? Had I not imbibed quite so heavy this fine summers’ eve I may have brought those up at this time. But after I heard the interview with Mr. Dawkins I did have a lengthy discussion with a friend who has been through Seminary and studied “Religion” at length. And that is where i learned the difference between being Religious and being Spiritual. My friend now being the latter. Having never been ‘to church’, except as a wedding guest, I can’t say I know anything about the subject of religion. Which probably makes me an expert in being able to discern the differences between the various faiths. Either that or I’m going to hell. But at any rate, Religion in general does serve a purpose, like any other faith. It’s not always good, but I’m a ‘believer’ in sometimes the ends justify the means. For the record, I might go so far as to say I am a spiritual person. But I also fancy myself as somewhat of an expert at perceiving reality. And my perception, thus far, says that there is likely something more to ‘life’ than sheer happenstance and the random good fortune of proteins lining up. Evolution and self-destructive behavior: Dawkins theorizes that evolution operates at the level of the gene. From the gene’s POV, and looking at the growth curve of human population, there’s no evolutionary advantage to selecting against self-destructive behavior. A gene’s job is to make sure that there are lots and lots of copies made of that gene. By that measure, human genes are wildly successful as is. There is no gene for long-term planning. Evolution and instinct: “Instinct” gets used in two ways. One meaning is behavior that is carried in DNA, not learned. A mosquito’s ability to dodge my swat. 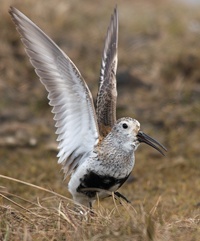 A bird’s ability to navigate across 8,700 miles of open ocean from Alaska to New Zealand. The second meaning is guessing the right answer on incomplete data. The first definition of “instinct” has obvious Darwinian advantage. The second one hasn’t been proven to exist; specifically, it’s not falsifiable. >The first definition of “instinct” has obvious Darwinian advantage. The second one hasn’t been proven to exist; specifically, it’s not falsifiable. Mr. Dawkins has an amazing ‘depth’ to his study but at the end of the day, he can no more ‘prove’ there is no God, than he can ‘prove’ that we are but a bag of chemistry. This of course is the ‘eternal’ question which may never be proven either way. But I would have thought as someone who had looked into the eyes of his new born child for the first time, as I have, that Mr. Dawkins would have some feeling of the existence of a power greater than ourselves. Or mabey his lack thereof just proves that he is nothing more than a bag of chemistry. But I’m guessing it’s more likely that his meme’s got messed up while he was at Berkley between 1967 and 1969. It happened to a lot of people…. WC will offer the same quote that Dawkins did at his lecture: Carl Sagan: “Extraordinary claims require extraordinary proof.” If you claim to have been abducted by aliens, you better have very good proof. Similarly, if you claim a supernatural, omniscient, omnipresent, all-powerful God, the burden is on you to come forward with proof. 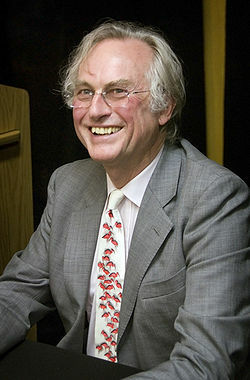 Dawkins doesn’t dispute that humankind has a strong predisposition to believe in a SOOAPG. But it’s not proof of anything. If you read The God Delusion, you’ll see that Dawkins makes a forceful case that denial of a SOOAPG is falsifiable. Funny, many would argue that we Humans ‘evolving’ out of a pond of goo (as Q would say) is itself a pretty extraordinary claim. However, if that is the case, and I’m not disclaiming that potential, then perhaps we might wish to be concerned about what ‘evolves’ next. Although I’ll likely not have to worry about it in my short time here. And thank God for that…. Extend your arms full length; that’s the time planet earth has existed. The length of your fingernail is the time mammals have existed. With the single pass of a nail file, you can grind off all the time that genus Homo has been on the planet. It’s very hard for human minds to grasp geologic time. A lot can happen, and has, across that much time.